Fondue can be just as much fun to make as it is to eat! 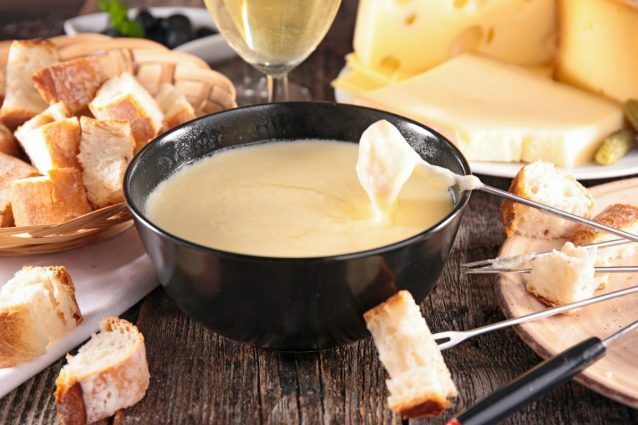 This is a basic cheese fondue recipe that is extremely versatile. Make this cheese fondue in a matter of minutes over the stovetop or directly in your fondue pot. Pair this tasty cheese dip with cubed French bread, fresh vegetables such as tomatoes or with fruit sliced for a salty and sweet treat. If you make the fondue ahead of time, simply reheat it in your fondue pot or on the stove top and use again- so simple! Grate or finely dice all of the cheeses. Place the cheeses in a medium sized bowl and toss together with the flour and nutmeg. Cube some bread, slice some vegetables or get your pieces of fruit read- which ever you plan on serving with your cheese fondue! In a medium sized saucepan or fondue pot, bring the white wine to a simmer. If you had the cheese in a saucepan, move to a heat proof container and serve immediately. If the cheese was in a fondue pot, keep the heat on low and serve! -If you don't have any wine or just want to try something different, try using beer instead. -If you find that your fondue is too thick, add a tablespoon of lemon juice and whisk in. The acid of the lemon will help thin the sauce and also bring out some of the flavors of the cheese. -Try using different cheese in the fondue, just be sure to choose a cheese that will melt well. Emmental, comte and fontina will all work well with this recipe!